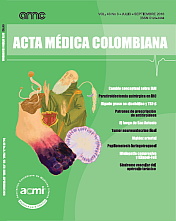 Introduction: the prevalence of disorders associated with thyrotoxicosis is not known in Colombia, nor pharmacoepidemiological studies are available on the prescription of antithyroid drugs. Objective: to determine the prescription patterns of antithyroid drugs and variables associated with their use in a population of Colombian patients. Methods: cross-sectional study, conducted between January 1 and March 30, 2015 on the prescription habits of antithyroid drugs in a population affiliated with the Colombian Health System. Sociodemographic, pharmacological and comedication variables were measured. A database on drug consumption was designed and student t-tests, X2 and logistic regression models were used. Results: a total of 327 patients in treatment with antithyroid drugs were included. The mean age was 53.7 ± 18.1 years and 78.3% of patients corresponded to women. Methimazole was prescribed in 95.4% of patients, propylthiouracil in 4.6%. In 76.8% of patients, comedication was present in particular with antihypertensive agents (38.2%) and additionally with propranolol (34.3%).